The personnel of the Catalan Institute of Classical Archaeology consists of researchers, scientific-technical services staff, administrative staff and research support staff. 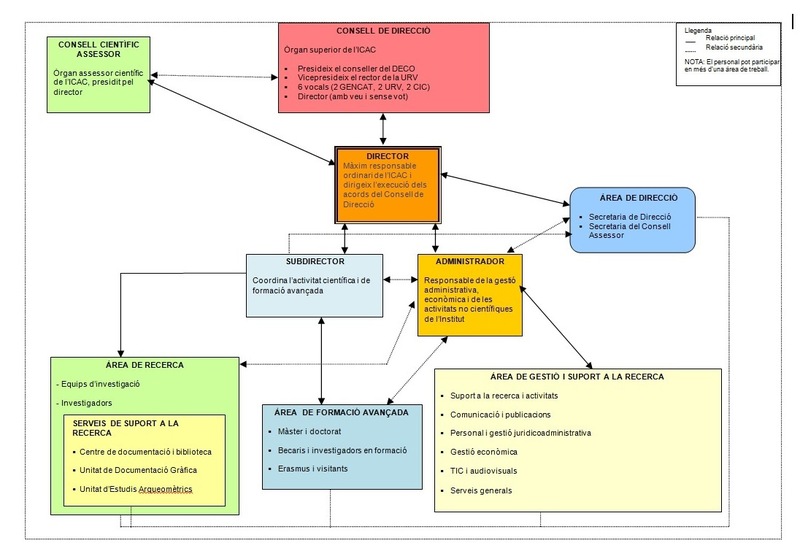 The ICAC has a flexible research structure organised into research teams that participate in the conconsolidated Mirades sobre la Mediterrània a l’antiguitat. D’Orient a Occident, de la Protohistòria a l’Antiguitat Tardana (MIRMED-GIAC) (MIRMED-GIAC) research group. Each research team is supervised by a coordinator. These researchers are contracted through offers of work from the Institute itself or public research calls. They take charge of or cooperate in approved research projects, belong to a research team and can participate in the advanced training courses the Institute organises. The group of contracted researchers also includes professors from the Rovira i Virgili University whose research is linked to the ICAC. These are members of the research staff who belong to other research centres (university teaching staff, museum curators, etc.) and voluntarily join an ICAC research team, either to take an active part in the programming of ICAC activities or to develop projects, programmes or lines of research in which the Institute participates with external or internal support. With these persons, the ICAC can benefit from the collaboration of researchers from other institutions and signs cooperation agreements with those institutions to regulate the terms of such cooperation. The ICAC also has individual researchers who have chosen to participate actively with the Institute as assigned researchers. These are staff members from other research centres (university teaching staff, museum curators, etc.) who manifest an interest in the ICAC’s tasks and a desire to cooperate in them at certain times or to follow them in general. As this type of researcher becomes more involved in the ICAC’s tasks, they may become an assigned researcher. The Institute is also able to count on the collaboration of specialists of recognised prestige who, as visiting researchers, participate in specific research activities or the advanced training courses. Trainee researchers come to the ICAC through public research calls (from the Ministry, the Catalan Government, etc.) or directly through the ICAC’s own calls. Through the position of predoctoral researcher, the Institute aims to foster the training of research staff. They carry out their research mainly within the framework of one or more projects approved by the Institute. The ICAC offers grants to students of the advanced training programmes it co-organises with the universities. The aim of these grants is to initiate students into the research field and to allow them to work with the Institute’s research teams. The ICAC also has the necessary staff for its requirements in the area of scientific-technical services, administration and research support.